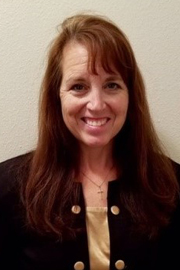 Christy Gantt is a Clinical Associate Professor and Assistant Director of Student Affairs in the Baylor University Doctor of Physical Therapy Program. After earning both BS (1986) and Master (1990) degrees from Texas A&M University, Dr. Gantt completed a MPT degree through the U.S. Army-Baylor University Graduate Program at the Army Medical Department Center and School (AMEDDC&S) and a DPT, also through Baylor University. Dr. Gantt has served in the U.S. Army for 23 years as a PT and physician extender, providing patient care, clinic leadership, and student instruction at various assignments in the US and abroad. As a civilian, Dr. Gantt has spent 10 years as the Program Director and full-time faculty in the Blinn College PTA Program. Through positions in both Military Medical Training Support and National Emergency Response Agencies, she has been an educator, facilitator, and designer of training exercises to develop and promote the skills of both civilian and military medical personnel as they prepared to deploy for response to various emergencies. She resides in College Station, TX and enjoys traveling, outdoor adventures, and spending time with her husband, five children, and friends and family.